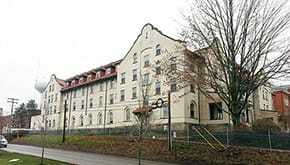 Originally built in 1905 as a dormitory, the renovated building will house departments focused on student success. In addition to a One Stop which will allow students to conduct University business virtually, the building will contain Admissions, Health Services, the Center for Student Development, Academic Enrichment and Tutoring Services. With rich history filling its walls, the team is working closely with the University to maintain the building’s eligibility for the National Register of Historic Places. The clay tile roof, exterior masonry, and interior woodwork will all be preserved. By renovating nearly all of the internal aspects of Becht Hall while preserving the exterior shell, this project can truly be described as “building a ship in a bottle”. Following the renovation, Clarion University’s Becht Hall will truly be seen as a blend of the past and present. Remaining a historic campus symbol, the building will move into the future with the incorporation of a geothermal well field that will serve 130 heat pumps throughout the building, keeping it on track to meet LEED Silver Certification. The renovation of Becht Hall is administered under the Pennsylvania State System of Higher Education (PASSHE) and Department of General Services (DGS) guidelines. Throughout the project Gilbane has served as an extension of the University’s staff and has acted in their best interest at all times.